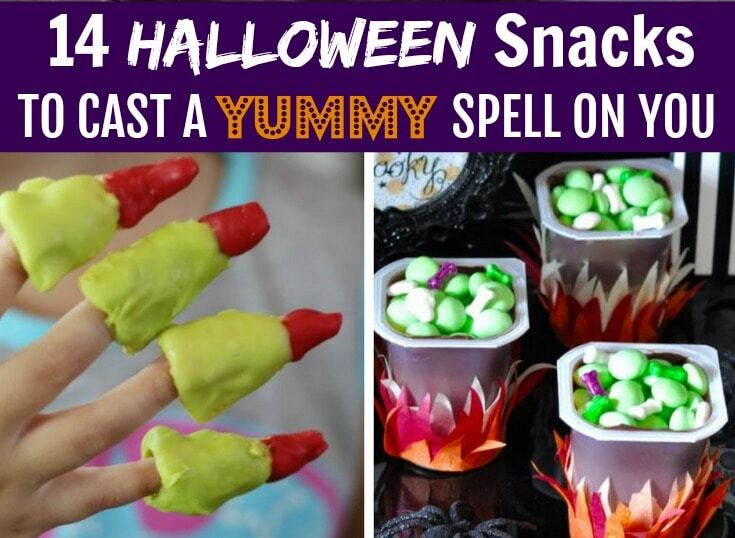 Cast a spell on your Halloween goblins with these yummy Halloween Snacks! There are some great ideas in this Blogger roundup that you can use at your Halloween party. Everything from cupcakes, sugar cookies, pudding cups, Peanut Clusters and more! Get the kids involved making these yummy creative Halloween Snacks. Spend a fun afternoon whipping up a batch of Halloween goodies to share or to enjoy with your family. Witches Brew Cupcakes by Shaken Together Life has some bite sized cupcakes that are perfect for a Halloween party with white and green bubbles and some star sprinkles to add a little magic. Cheesy Witch Fingers by This Vivacious Life are quick and easy to make. All you need is Mozzarella Cheese sticks, cream cheese and almond slices. Witch Melt Peanut Clusters by Frazzled and Frugal are really cute with the witches hats, white chocolate almond bark, Spanish peanuts, raisins and pretzels. Witch Hat Kiss Cookies by Dizzy, Busy and Hungry are fun no-bake Halloween witch hat treats that are so easy to make and yummy to eat! Witch Hat Sugar Cookies by A Dash of Sanity will be a hit with the chocolate coated cone with a soft and chewy sugar cookie. Halloween Snack Collection by Pillsbury has some really spooky Halloween snack recipes such as Zombie Eyeball Granola Bites, Fruit Roll-Ups Wicked Witch Hats and Monster Cereal Munch. Check out these other awesome Halloween Snack Ideas!